How Does AdvantEdge Deliver Superior Results? Comprehensive EMR, ECC and hospital interfaces not only collect anesthesia billing and coding information quickly, they have built-in error correction and reconciliation processes to assure that every service performed is billed. Anesthesia coding is performed by AdvantEdge certified coders, assuring accurate and compliant anesthesia billing. When anesthesiologist or CRNA documentation is unclear, our coders request immediate clarification for accurate billing, Our coders also provide regular feedback to improve physician documentation and, where desired, physician education classes. Sophisticated claim edits assure that only clean claims are filed. In fact, 99% of all claims filed are accepted by payers. Along with payments, all EOB information is posted, including denial information. Secondary claims are filed automatically as soon as primary payment is posted. If a patient balance exists after insurance payment, a statement is immediately issued. Patients can pay via an online portal, phone or mail with the full variety of payment types available: credit card, check, e-check, etc. Denials are processed immediately by the appropriate anesthesia billing specialist, based on the type of denial. Underpayments are identified and worked by an insurance specialist. Delays in payment from insurers or patients are processed by A/R follow-up experts. All anesthesia billing work is visible to clients on a daily basis. Comprehensive reporting and analysis is provided monthly and, where requested, on a daily and weekly basis. The AdvantEdge Client Manager works as an extension of your anesthesia practice or hospital and is available at any time to answer questions and to provide additional information on the full range of anesthesia billing, coding and business intelligence. We provide the full spectrum of anesthesia practice management services, starting with enrollment (credentialing) and contract negotiations. Plus, as required, some or all HR, accounting and financial support. In the past, a set of monthly reports was all that was expected of, and offered by, an anesthesia billing company. Today anesthesia practices expect easy access to current billing results every day, whenever they wish. The InfoEdge online portal provides HIPAA-compliant access to a summary and details of charges, adjustments, payments, A/R, and case volumes. The data is updated daily with “drill-down” access to detailed information by payer, provider, location, type of service, etc. It can be exported in a variety of formats. In addition, regularly scheduled reports are delivered to InfoEdge with no delays from paper distribution and no need to email patient-protected information. Ad hoc reports can also be requested via InfoEdge and delivered to the dashboard. The entire dashboard and reporting system conforms to federal standard NIST SP 800-52 and other relevant standards required by HIPAA and HITECH encryption standards. AdvantEdge clients also have access to InfoEdgeBI, a powerful Business Intelligence Analytics tool set also used by AdvantEdge Client Managers to provide custom reports, ad hoc analyses and personalized support for your practice or hospital. AdvantEdge believes in complete transparency when working with our clients. InfoEdge is one dimension of that transparency and visibility. Personal communications is another key dimension: we communicate in as many ways as you wish about practice performance, day-to-day management of the revenue cycle and strategic direction. At AdvantEdge, we know that your practice and hospital are more successful when communication flows easily from the billing office to your sites, physicians, and administration. Your AdvantEdge Client Manager represents our entire company and is available to you at any time. Our team of coding, billing and practice management experts regularly provide their insights. And our executives are an integral part of your support team. Every one of our staff members is focused on the performance of your practice. Unique in the industry, our staff members have incentive bonuses tied to superior results for your group. As a matter of philosophy, we want to operate as a business partner, not just a vendor. We find that this cooperative, “win-win” approach yields better results for you and for us. We look forward to the opportunity to demonstrate how this partnership can benefit your anesthesia practice and hospital. Billing in House? Could a Billing Company be a Better Solution? Is growth in your practice or hospital making it hard for your billing staff to keep up? 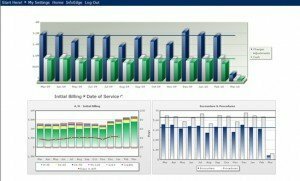 Are your current billing costs too high? Does your billing staff not find time to work A/R? Do routine billing tasks take too long? Is your software vendor “nickel and diming” you for updates? If you have any of these symptoms, we can help. Traditionally, some practices have felt that they needed in-house billing to keep “control.” With today’s sophisticated informatics and communications, we allow you to keep that control. In fact, many practices now feel that they have more control with a billing partner than with their own staff. In addition to cost advantages (a variable billing cost instead of the fixed and growing expenses of an in-house operation), a billing company has a much deeper bench of expertise available to your group. And companies like AdvantEdge offer technology capabilities that no in-house operation can afford or develop. To find out more, learn about the Financial Performance Edge: a way to compare costs and capabilities on an “apples to apples” basis. Then you can decide which is the best solution for your group. You can learn more from our whitepaper about how to compare in-house billing to a billing service.